Rather a contrast this to Wednesday's post on dressing for hot weather. But it's good to look ahead to Autumn (God I'm looking forward to it - the coats, the knitwear, the hats!). And it's nice to be able to write about something that's actually in the shops, rather than sold out everywhere. The big, chunky cardigan is from Ralph Lauren Purple Label - still my biggest weakness when it comes to designer brands, and the one that has appealed to me consistently over my adult life. In fact, I would say RL is the only brand that achieves the core thing we want from menswear, season after season: new temptations, but always within the same ethos. And with an awareness of menswear traditions at their core. I've wanted a cardigan like this - loose and long, with a belt - for quite a while. The belt means I have the ability to wear it undone and slouchy (as above), or done up and fitted (top). I also love shawl collars on knitwear because it is the one design that can be worn perfectly with both a T-shirt and a collared shirt. In some ways more interesting than the knitwear, however, is the denim, as it is the first piece from Anglo-Italian to be reviewed here on Permanent Style. Jake and Alex have had their denim made in Japan, and focused on one style in three washes. More washes are to come. I haven't had washed denim in years, mostly wearing Albam and then Levi's-bespoke raw denim, which of course starts off very dark and then lightens over time, reaching a mid-blue that varies in cast depending on the indigo. I deliberately chose the shade from Anglo-Italian pictured because it is just too light for my raw denim to ever really fade to. The other two colours, shown below, are much more of a traditional mid-blue (right) and a very pale summery blue (left). I do like the colour I chose - it looks great with navy above the waist, and is for me a rather nostalgic shade: one I wore a lot when I was a teenager (although from Gap - not at the same level). I won't go into the quality of the denim or make, firstly because it's not a specialist area for me, and secondly because there just isn't that much to quality in the make of jeans. Certainly compared to tailoring or shoes. Denim's quality shows in how it wears and lasts over time. And that's something I can't begin to comment on yet. The cut of Anglo-Italian jeans is mildly carrot-shaped, fitting fairly close in the thigh and then tapering noticeably towards the bottom. They have a mid-rise and are made to end well above the shoe, with a small turn-up. I would have thought the leg shape wouldn't work on me, given I have relatively big thighs and a big seat. But actually the thighs have given just enough after three or four wears, and now fit perfectly. They were made to order, as most Anglo-Italian product is, in a 34-inch model with about an inch and a half taken out of the waist. So the legs and seat of a 34, waist of 32.5. Interestingly, Jake and Alex designed the jeans to go with their jackets, yet the cut is different to most others produced by brands with tailoring in mind (such as the Armoury or Drake's) which are usually high-waisted and cut straight in the leg, in a style more similar to formal trousers. I have to say I really like the jeans, and they're something I'm really looking forward to wearing again as the weather cools. 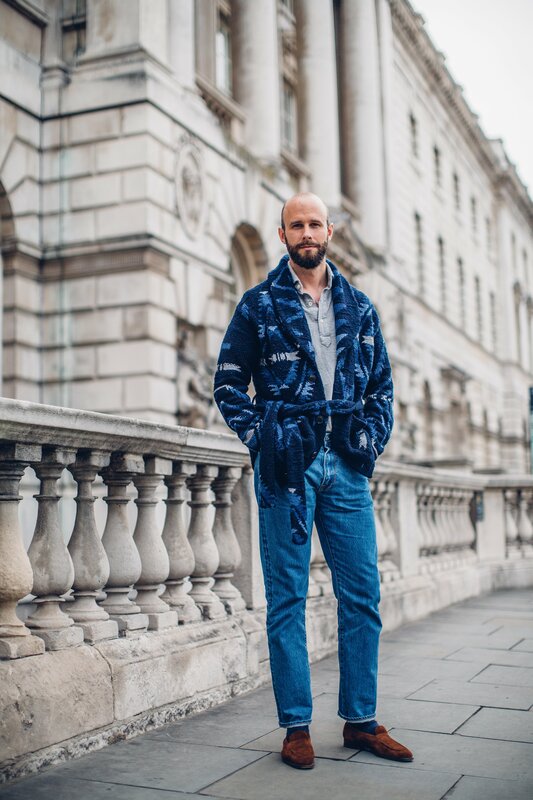 But denim is more subject to fashion than most other things we cover, and it may well be these appeal so much because they are simply different to all the raw, dark denim that's been everywhere for the past 5 years. You can follow the discussion on Anglo-Italian denim and Ralph Lauren cardigan by entering your email address in the box below. You will then receive an email every time a new comment is added. These will also contain a link to a page where you can stop the alerts, and remove all of your related data from the site. Interesting you mention wearing GAP as a kid. It would be great to see you do a ‘timeline’ of your clothing journey. For example, Trousers …….in 20’s you’re wearing GAP , 30’s Incotex , 40’s bespoke. It would just let everyone see the journey you’ve made and comfort us all along our road. I agree with a timeline though. Not really my style.I think the cardigan is too flashy. Sorry Simon , it looks like a half length bath robe ! Certainly something to wear indoors or very , very close to home ( dependent on neighbourhood!). Interestingly the least tailored item ever reviewed on PS . Maybe just the antidote to all that fitted stuff we’re so used to. I’m sure it’s very comfortable to wear whilst sat at home on a cold,rainy winter’s day watching episodes of “Starsky & Hutch” ! I’m looking forward to seeing the comments from PS’s more traditional readers… who will no doubt blow a gasket at the boldness of the cardigan. Should make for fun reading. Love this look Simon and may I say how nice it is to see such casual clothing featured on PS. Dare I say these types of posts are more relevant to the modern man than those on tailoring for better or worse… superb cardigan and those jeans look great. Need to get round to paying Anglo Italian a visit. Haha, I thought exactly the same thing re: traditional readers! Please keep sprinkling us with some of these more relaxed looks Simon, they’re very much appreciated! It may not surprise you but you DO have some younger readers who as Clav has said don’t typically live and play in environments that call for most of the outfits you wear, talk about, review, commission… even afford. So this is a welcomed and apprecieated piece. Agreed.. I refer to myself as a being a difficult age actually. Early 30’s, meaning I want to dress like a grown up now and elevate myself slightly, but I also need to maintain a youthful edge to not seem older than my years. A difficult line to walk sometimes. You said the denim is the first thing you are reviewing from AIC. What else is on the docket? How much are the jeans? I like Anglos stuff but it seems a bit expensive for what it is. How much difference is there between those jeans and a pair from a designer jean company like nudie or diesel which cost far less? It’s the cut and fit that’s the difference. Can you find a Nudie or Diesel with a nice mid-rise like these? Vast majority of “premimum” denim brands cut a very short rise, around 10″ for a 34 waist. I find that jeans with an 11.5-12in rise fit much better but they’re nearly impossible to find in lighter washes/distressed. I have raw denim that’s taking years to fade because I don’t wear it a ton. So there’s a real need for well-cut, higher-waisted jeans like these Anglo-Italians. Have you tried Jacob Cohen? I wonder how they would compare…price point is similar. I have a preference with JC over Albam, or even some of the Japanese demin brands I have used in the past. A bit too Starsky and Hutch for my liking…….jeans look great though! I bought the lighter shade of their denim, which I’m actually wearing today, and I really love it. Great fit, perfect shade and good fabric. Jeans look fantastic, and the sweater is wonderful. If only there were more jeans with this type of fit in distressed/lighter washes! Anglo-Italian is sold out and it’s a bear finding denim with a higher rise, generous thigh, and gracefully tapered leg. How do Anglo-Italian’s jackets compare with Drakes? I notice the latter have hiked their prices recently, just wondering whether it’s worth paying the extra? From what I recall, Anglo-Italian’s have more handwork, but Drake’s are still made very well. Belvest is the best for that style. I can include more details when I review the former at some point. I recently bought a pair of the jeans and like the cut. I agree with your comments Simon and have to say yours look particularly great with those Edward Green loafers. Simon, a random question I am hoping you will be able to help with. I’m currently in my home country and have spotted a lovely dark blue suede bomber in the sales… fit is perfect BUT the suede appears a little shiny which puts me off and it would be much better were it matte. In your experience do suede garments start of like this and then lose their sheen as they patinate, or will I be a fool to buy it and expect it change? Separately, would you ever wear tapered jeans like this with tailoring? One post I would look forward to! In the subject of price of these AA jeans whilst they maybe on the pricey side compared to some very good denim brands the difference between RTW and MTM is very sensible considering how much it would cost to alter the waist and length on any pair of RTW jeans. Yes, was assuming only Neapolitan cut, rough texture, etc. with said jeans. Do you think some styles might work better with tapered jeans vs. straight leg though..? Look forward to that post. Unfortunately not a fan of the cardigan, thought it was a bathrobe too. Viewing the lead pic, my eye gets drawn to your feet, but possibly because of the grey background. Would this outfit not have been an ideal occasion to wear your Common Projects? Your pristine whites, or even your beater off-whites. Re your post…various degrees of formality. BTW, viewing on my iPad, as opposed to notebook, texture of cardigan looks like you would want to wear it even if you were a bit warm. Hey man, there’s a beverage here. And that rug really tied the room together. Good look and a great occassional counterpoint to the tailoring content. Not a huge fan of RL but this one looks great. The look you have put together, in a fashion sense, is quite advanced – a year or so ahead of mainstream (blues, washed denim, overall silhouette etc.). The RL catches the eye but it is the cut of the jeans that really makes the outfit. p.s. the shape of the denim cut is ‘tapered’ (vs. ‘carrot shaped’). I’m a big fan of the loafers you are wearing in this outfit, could you provide some insight? Very uncool knitwear.Simon,in your quest to add variety to your website you are venturing into contentious territory.The cardy is too long,too garish and the belt makes it look like a dressing gown.I would’nt take one jot of notice of those gents who applaud your choice.There are always supporters of the Emperor’s new clothes. 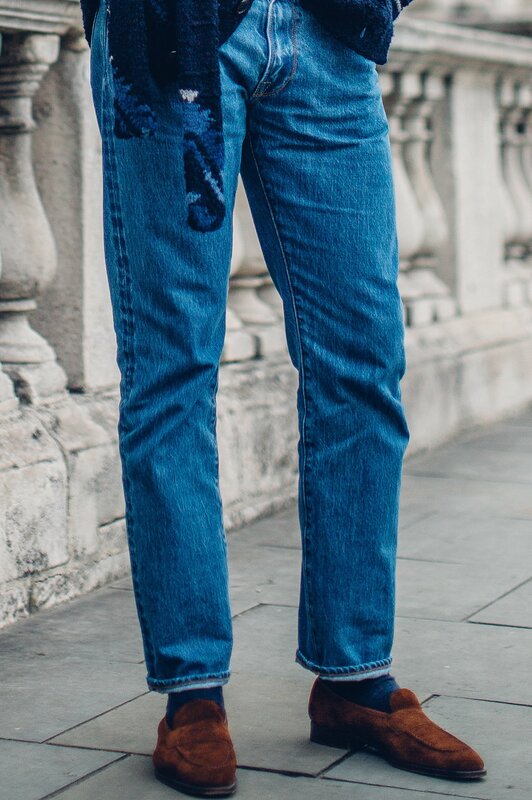 The jeans are fine,looks like a nice cut.The shoes ditto…..I would’nt go any more formal here….oxfords would be a complete no no…suede chukkas and snaffle bit loafers ..yes. Thanks, I knew there had to be some who wouldn’t like it! Only the style of this cardigan isn’t ‘new clothes’ at all, emperor or otherwise. If you consider this garish then fair enough but it’s a good thing you’re not the sole arbiter of taste. You certainly are entitled to your opinion but you don’t get to define what is cool or not. The RL exudes an exorbitant price to quality ratio which would be irrational to pick over the multitude of designer options out there today. 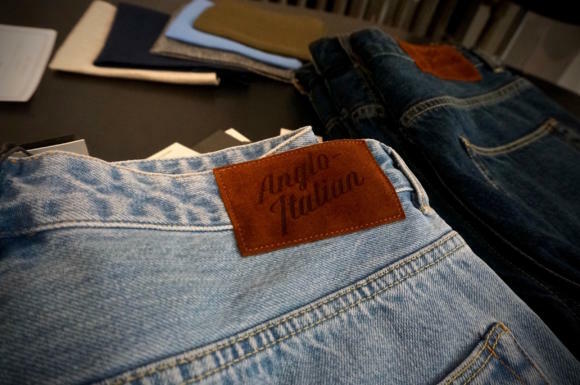 Also why are anglo-italian denim even being promoted when they are a new outfit and as with all new products need numerous iterations to get right in terms of quality. You can’t really say that just because someone is new they haven’t gone through lots of iterations. Some brands do half a dozen prototypes before they launch something. Others do one. This truly ugly cardigan, frivolously priced at 2.500 USD, shows how fashion is eroding classical menswear and the mission of Permanent Style. While PS claims to promote thoughtfully building a wardrobe of a few, artisanal, timeless pieces, it is being side-tracked by the maelstrom of fashion – the insatiable need for more, different stuff. If it’s mindlessly expensive it just adds to the allure. It is the millennia-old story of fashion – so well put in Thackeray’s descriptions of the idle gentlemen, for whom a major way to get a little thrill and meaning to their lives was buying that 50th pair of cufflinks. Dear Simon, may I ask how it fits the mission of PS to suggest buying this one, idiosyncratic cardigan at the price of getting a full-array of top quality, timeless knitwear (e.g. 8 top-notch Luca Faloni sweaters)? Also, may I ask how you embody your blog’s often-stated mission of building a focussed wardrobe of a few, timeless pieces, with your commissions of hundreds of bespoke items plus your quest for new, different excitements like this cardigan? Would you say you are still true to your original mission statement or are you in the grip of consumerism? Or is it all for the sake of nurturing the business success of your site and how does that comply with your original pro-bono, enlightenment mission? Hi. Thanks for your view. – The vast majority of PS coverage does cover well-made, well-priced, timeless pieces, but I am only human and sometimes I fall in love with more design-led pieces, such as this one. – The same goes for tailors. As I have also said in the past, I would not recommend using anywhere near the number i have done. I have been very clear on this. But, to have knowledge sufficient to recommend specific ones to readers, it is helpful to do so. I also agree that allowing oneself an occasion indulgence is only human; that applies not just to fashion but to food, drink, luxury items etc. I understand the reason for you answering but I don’t think you need to justify your purchases to anyone as it’s YOUR blog and people can choose not to read it and go elsewhere if they really feel so aggrieved! I completely agree. I do find it helpful to answer points like this though – not necessarily to justify myself, but more to re-assert the values of the site for any of the thousands of new visitors there are every day. Many thanks Simon. I think you missed the key point of my post, though. As I see it, your excellent blog is founded on the premise that classical menswear gives pleasure and piece-of-mind by focussing on owning a few very well made pieces, produced out of the best materials by the best artisans and made to last. Hence, it is the antitheses to fashion. Its core is reduction. It is about selective, rare, well-thought out, high-quality additions to your wardrobe. As your blog and its readership has been growing the demand for more and more material has risen. 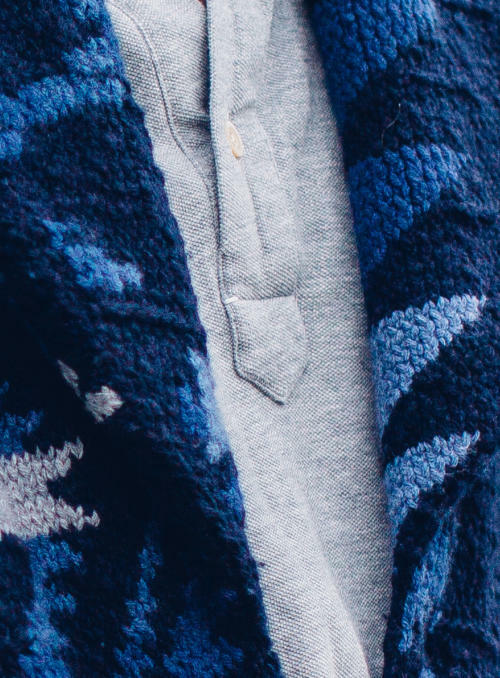 This has been leading to a frenzy of new commissions and to moves to straightforward fashion pieces like this cardigan, which in its limited wearability and poor value for many is the antitheses to a classical menswear piece (say a high-quality plain navy cashmere sweater, which you would wear exponentially more often than this cardigan). Hence, my question is: is the reductionist goal of classical menswear, which frees you from the urge of consumerism, realistic? Or is classical menswear just a different form of fashion, which eventually leads to the same frenzy just in a different form – i.e. having 10 nearly-identical navy suits, 50 casual suits each of which you wear only twice a year, and, if that is not enough of a novelty anymore, occasional limited-use, expensive fashion items like this cardigan? I think the short answer is, somewhere in the middle. This blog is about buying less, and buying better. But, it is impossible to love clothes and then, at some point, effectively turn that off. You need to buy less slowly and gradually for that to happen. It’s a worthwhile thing to try to do. I do not consider this a straight fashion piece, or think it any less useful or expensive than, say, my Loro Piana gilet. But not worth going into that here. despite what anyone thinks about this cardigan (I’m not a fan of the design work I but quite like cardigan if that makes sense) I had a look at the description on the US site and the amount of hand knitting that goes into certainly does make it a relevant PS piece, albeit maybe a little off on the price/quality ratio, but sometimes we have to overspend for love.!! Otherwise no one would buy a tom ford suit.. plenty of people must love it too as it is nearly sold out….one thing I noticed though is the RL site gives a slightly different composition of wool/ cashmere/ silk. I like this, bold and fun and no doubt extremely comfortable, though, on balance, I prefer the Connolly cardigan. A big bulky item though, and it makes me wonder about how you store your clothes. I’m a bit worried about my own closet, which is getting jam packed. Could be a useful ‘How to…’ post? Hey Simon, unrelated to the post but I’m sure threads from buttons on your shirts must have come undone in the past. Do you sew them back yourself or get a steamstress to sew it back? Curious as some of my buttons look like their coming off but they are sewed in the crow-foot style and are shanked. Have been looking around online but cannot seem to find any resource that applies to shanking buttons on a shirt. Much appreciated! I would have gone a bit more relaxed and just put a white v-neck underneath—maybe a darker, less saturated shade of denim or cords. But the sweater itself is delicious. I’ll happily take it off your hands if you begin to be swayed by one of these “not-classic-menswear” critics. Morning Simon, while I really wish I had about 2/3rds of your wardrobe I really, really wish I could have a pair of trousers or jeans that were 34 waist and had to have an inch and a half taken out. My huge problem with ready wear clothing is that after a lifetime of playing rugby and rowing at university my thighs are significantly wider than is usual. Any ideas of brands that I could fit into? On a wider note I hope you would agree that it is far easier for a thinner man to look good than a fatter one. You are quite thin, certainly thinner than I am, hence you could make a potato sack look stylish – us poor old fatties have to consider other options. I remember a couple of other posters suggested using PS readers to test MTM products I wonder if, (unless you were willing to gain 20 kilos, a whole new wardrobe – just think of it!) you would ever consider a series of articles using people of different shapes as they decide on their wardrobe? I’m not going to be a good resource for ready-made brands that will fit well – although there are an increasing number out there with a higher rise (eg Drakes), which will generally be an easier fit than a lower rise for someone with bigger thighs. Equally the trend for wider trouser legs. The good news is that bespoke will always make the best out of whatever a man has, and I’d recommend going down that route if you have such fit issues. It is much easier to justify than for someone like myself. Do have a look at the ‘suit style’ series of posts as well – there is a lot there about how fit affects the look you create. It’s less about just looking ‘good’ or stylish in clothing, and more about what you want to achieve. Eg do you actually just want to look slim, in the shoulder and the waist and the thigh, or do you just want to minimise any stomach etc, but happy to keep the same shoulder width etc. I will certainly consider some pieces on different body types. I seem to be the only one who dislike the jeans; to me, they look very ordinary, at best. If not badly cut, and the colour uninteresting. While I dislke skinnies, what’s wrong with, say, a slimmy (or a Standard) cut from 7 (european version), worn with the right shoes? Today, jeans are not as low waist cut as they use to be. Going on in the criticsm phase, I find most Edward Green models to be very boring. A shame for a shoemaker of such quality. Classic does not necessarily have to mean boring. The jacket is what I prefer here. The cut is not for everyday but the color mix is nice. Not many here will agree with you on your jeans statement but I certainly do. I would look very silly in a pair of skinny jeans but the Slimmy from 7FAM are a perfect cut for me ( I have about 8 pairs) the rise is on the low side, but not too low for me it is “trendy” or “fashionable” But saying that despite the cost they are not at the same quality level as say AA or dare I say it even many of of the Levi’s I own. Regarding quality, the 7s designed in Europe are better than the US 7s. I believe the 7s come in fabrics that I will never find at Levi’s. AA is a surprise to me, I have not tried their jeans but the polo they make, are well cut but terribly made. The antithesis of a tailored look, isn´t it? I share your fondness for Ralph Lauren but this piece seems to maximize the chunky cardigans problem of silhouette distortion. Doesn´t the placement of the shoulder seams make you look formless? It’s not that different to a raglan-sleeved overcoat, which is often cut very square and straight as well. In fact, this has more shape and line than many such pieces of outerwear, given the ability to cinch and shape the waist as much as desired, and the flattering effect of the shawl collar, which is similar to a shawl on a dinner jacket in the way in rounds but lends greater bulk to the chest. I disagree with your position on there being “not that much quality in the make of jeans”, however I think it is easier to create a ‘good’ pair of jeans and the fit, fabric and construction of jeans generally come under less scrutiny than the tailoring world. I’ve had a pair of custom jeans made and there was A LOT of details to think about in conjunction to custom trousers including type of stitching used for particular seams, bartacking vs rivets, metal & color used for rivets/buttons, chainstitch vs lockstitch, yoke shape, pocket shape & size, pocket detailing, other detailing, potential chainstitch embroidery in conjunction with fit and fabric choice. Companion Denim is a good site to check for the options one might have on a pair of custom jeans. My point is purely relative – that there is not as much to quality in jeans as there is in tailoring. Which is fairly obvious, given the different levels of make in tailoring, both in terms of fit and stitching. Although there are all those choices with custom jeans, none of them make as much functional difference as having a hand-padded canvas or not, or as much aesthetic difference as having a bespoke-cut pattern or not. Great jumper… nicely photographed too! I continue to think the cardigan remains an eye catching piece. However at £1,870 on Mr Porter the price needs challenging. RL has an ordinary mark up of 600% or so suggesting a cost price of £300. However some quick research shows UK/Ireland handknitted pieces from €79.95 with quality virgin wool! It is my guess that it will have been a ‘developing nation’ product suggesting an even lower unit cost (as low as $40 – $50). If so I find this aggregious in the extreme – exploitation of poor workers, mass profiteering, rip- off first world pricing under the guise of luxury and a mass market fooled by advertising. Simon I know you have taken some criticism for the sartorial choice but the real issue here is one of the ‘business’ of fashion. Ralph Lauren is worth around $5.7 billion…ask youself how this was achieved – how much of the sweat in creating garments such as these was properly rewarded? You rightly champion the cause of the artisnal worker and the bespoke product. The RL product, as some have observed, is directly opposed to this ethos. If we are to regard ourselves as intelligent, civilsed humans then we must address the lot of those who produce. We must reflect upon the economies that underly RL (even companies such as Topshop…) – and the conditions and pay. The only intelligent conclusion being to boycott these companies until the unseen poor who produce such exorbitantly priced garments are properly remunerated. I understand the entire fashion world is afflicted with this issue – and it needs addressing. Thank you, and I agree that companies that abuse their workers should be boycotted. But to be fair, you have no evidence that Ralph Lauren does so, let alone that this garment involved such practices. Storage is an issue. Fortunately we’ve just moved into a bigger house, with an attic! I really love this look. It’s a great fit for brunch, a few pints down at the pub or just slouching around. For where I work, it would be fully office appropriate as well, but the demise of office dress code is not the topic at hand. I tried on a similar styled cardigan from Eidos last fall, hoping to achieve something similar, but it just didn’t work on me. I think it’s mainly due to my height (195 cm) making it quite short on me, disrupting the intended style slightly. Oh well, there’s always next season. Yes, I really liked that Eidos style too, but found it too short. This is a little longer. One advantage to a sloppy cardigan is that you can size up sometimes, and get longer length, given the fit in the waist doesn’t matter that much. Different style, but it can solve the length issue. Some look nice with the cuff turned back too. Are you aware of the history of this sweater? 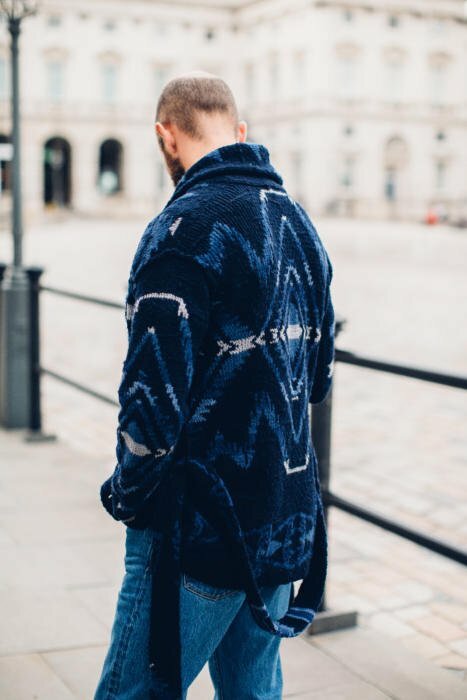 Although Native Americans and frontiersmen had been making clothes out of wool trade blankets for centuries in Canada, your sweater is inspired by clothing made from Navajo blankets in the early 20th Century for the tourist trade. The American Southwest was a destination made popular by the new railroads, and along with silver and turquoise jewelry and pottery, garments like this were stylish souvenirs. Leave it to RL to translate these designs into cashmere, but like so many of the firm’s inspirations, it harks back to WASP style before WWI. I am, yes – the focus for this piece wasn’t necessarily meant to be the sweater and its value, but that’s where it seems to have gone. This use of traditional aspects of menswear is one of the things again that I have always liked about Ralph Lauren. And having known several people over the years that have worked for Purple Label (including Mr Vizzone), I know how much work goes into the research for these pieces and patterns. One such employee once told me that Purple Label is so expensive to make, in terms of both materials, craft and particularly design manpower, that every piece that is on sale is making a loss. But I’m sure most of the RL naysayers here wouldn’t believe that. 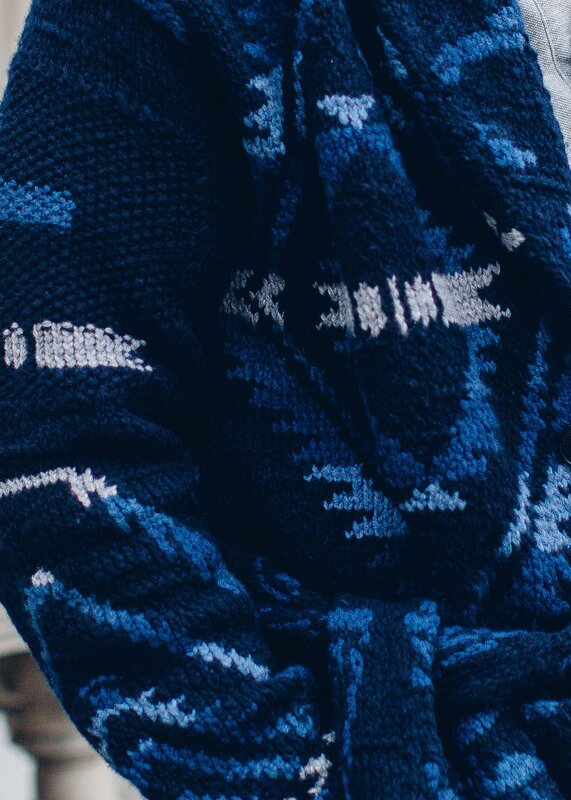 Very nice sweater. I’d like to make a correction: your sweater is actually 56% wool, 43% cashmere and 1% silk. It’s a bit of a shame that this is my first post here, becasue I have to say that everything (!) else I have seen here was truely fantastic, this sweater is not though. And it is not becsause it is ugly or so, in faxct it isn’t. My problem with it is that if you wear it in the presence of other people, they will start to think about this sweater, just because it is so… well… big in every respect. Some will even say “Nice sweater”. And I actually don’t like that. The stuff one wears should be truely beautiful, but in a way no one directly notices. That’s a bit of a credo, I know, but a rule one should really never violate. And this is also one of the iron principles of this blog, at least how I see it. Thanks. Backs up what everyone else (including Vizzone, Ciongoli etc) always tells me about Purple Label. Worth also pointing out how lovely and irregular the knitting is – with ridges and patches – deliberately to give the impression of a vintage piece. Which wash are the jeans? Are they dark wash in the Anglo italian website? Lovely outfit Simon. Re RL being your weakness as a designer brand, is that just the Purple Label? I saw on Mr Porter it’s £1870. Why is the Purple Label so expensive? Also are the jeans selvidge? And I disagree with some of the comments that it’s a stay at home outfit – everything about it is absolutely stunning! Given that this article was published a few months ago; can you now comment on how the Jeans wore and lasted so far? I am thinking about getting the exact same model, just with the 32” inseam they now offer. They’ve worn well, Felix. Given they’re washed already, they don’t wear in like raw denim, but I still like the style and fit. Following up on this comment, has the waist/seat stretched at all? Or remained true? Some brands I buy fairly snug in the waist/seat because they stretch a lot and some never stretched and I’m stuck with jeans that are too tight. Thanks in advance.